At 78 years of age, Marjorie had enjoyed an extremely healthy life and was exceedingly active for her age. Marjorie still worked her own vegetable garden, walked two miles every day, exercised, helped her husband with the lawn work, took care of all the housework, and cared for her grandchildren frequently. Unfortunately, in 2008 Marjorie was diagnosed with thyroid cancer and had to have her thyroid removed. Following surgery, she returned to her activities without difficulty. However, in 2009 she began experiencing a chronic cough. She consulted with several physicians and specialists but the origin of the cough remained undetermined. When her cough continued into the next year and was getting worse, her doctor took a sample from her throat and sent the cells to the Mayo Clinic to be tested, the results came back as “suspicious.” Following an immediate PET scan, lung cancer was discovered in her right lung. 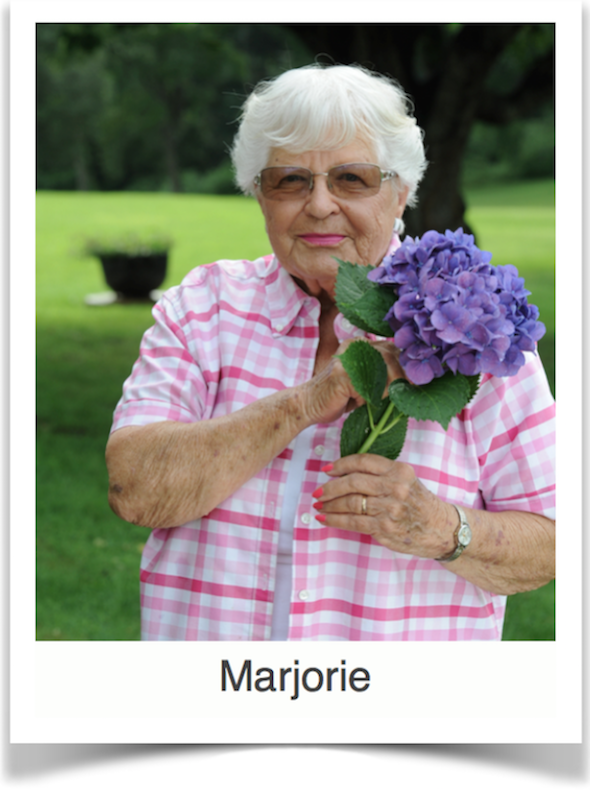 Marjorie had her lower and middle lobes of her right lung removed in October of 2010. Following that surgery, she continued treatment by receiving both chemotherapy and radiation. She was discharged from the hospital two days later and received home-based physical therapy for two weeks. She was told to walk several times a day to help regain her strength. However, she was not regaining her strength to her doctor’s satisfaction and she still was experiencing significant diminished lung capacity. Her doctor referred her to outpatient physical therapy. She initiated her physical therapy at Blaser Physical Therapy where her son had received physical therapy and was pleased with the facility. Marjorie recalls that she was very weak and was experiencing severe back and hip pain. Her physical therapist developed a rehabilitation program to address her weakness as well as her pain and poor endurance. Marjorie’s physical therapist determined that her back pain was directly related to her incision from her lung removal. She received scar tissue mobilization and within weeks, her back pain resolved. Her strength and endurance made significant gains also allowing Marjorie to begin enjoying her independence once again. When Marjorie’s hip and thigh pain was not resolving, her therapist followed up with her physician to confirm hip joint pathology and rule out concerns of metastasis of her cancer to her femur. An MRI confirmed that her pain was due to a degenerative hip joint and Marjorie eventually underwent a total hip replacement. Following her total hip replacement, Marjorie returned to Blaser Physical Therapy and once again regained her strength to participate independently in her daily activities.